On April 30, 2015, Tesla Motors unveiled its Powerwall and Powerpack lithium ion batteries for homes and utility-scale applications, which could facilitate an increased role for wind and solar energy resources that have so far been limited by a need for storage options to address the intermittent nature of their generation. 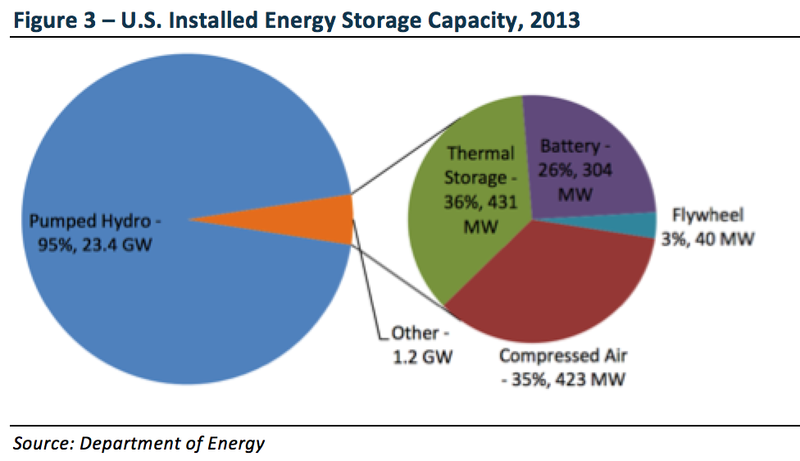 Recent studies from GTM Research and ESA project the United States deploy 220 MW of energy storage in 2015, more than three times the 2014 level (Figure 1). In 2014, the U.S. energy storage market accounted for $128M from an installed 61.9 MW, approximately 40 percent above the 2013 level. Ninety percent of the new 2014 storage capacity was in front of the meter, while the remainder was behind the meter at residential and non-residential sites, reflecting a burgeoning demand for utility-scale energy storage technologies. By 2019, energy storage is projected to represent a 861 MW annual market valued at $1.5B, with behind-the-meter storage accounting for 45 percent of overall storage market. At the utility level, Tesla’s Powerpack battery could open up avenues for utilities to grow wind and solar energy in their power generation matrices. The Powerpack system comprises 100-kWh battery blocks grouped to scale from 500 kWh to 10 MWh – capable of two-hour or four-hour net discharge power using grid-tied bidirectional inverters. The scalability of the Powerpack is a critical innovation, as it will allow for the application to gigawatt-class installations, which has not been possible with current technology. The low cost of the Powerpack batteries will also allow for wide-scale deployment previously not anticipated before 2020. Analysts have suggested that utilities should purchase and install huge batteries to its grid if they can be purchased at $350/KWh. However, they warned that price point wouldn’t be a reality in the next five years. Elon Musk, founder and CEO of Tesla, said that the Powerpack batteries would come with a price point of $250/KWh. For homes, the smaller Powerwall battery will have significant impacts on consumers and utilities by operating from behind the meter. Tesla’s Powerwall offerings include a 7-kWh model ($3,000) and a 10-kWh model ($3,500), both of which would make electricity from residential rooftop solar panels available at any time and eliminate the need to sell excess solar energy back into the grid. The issue of excess electricity has been a major speedbump for residential solar energy that a number of states are working to address. In Hawaii, where residential solar panels per capita are 20 times the national average, panels have remained idle as utilities work to resolve reliability issues associated with incorporating electricity buybacks. Vermont-based Green Mountain Power Corp. is working with Tesla as a “channel partner” on the Powerwall battery, and Virginia’s AES Corp. has also signaled its intention to leverage home batteries in its power distribution platform. 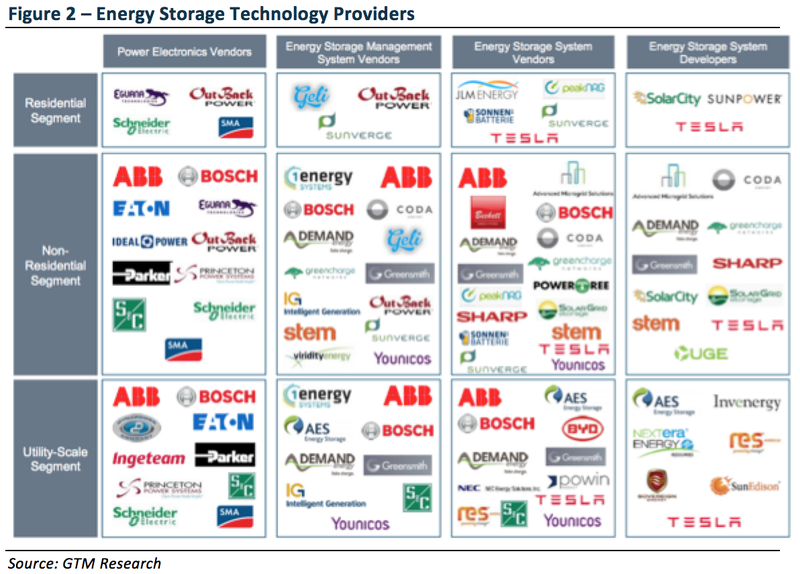 In addition to Tesla, a wide range of companies are also working to supply the growing energy storage market. With a market capitalization of just under $50 billion, ABB is one of the largest companies in the energy storage space. While the company has a diverse range of electrical technologies, it currently has 1,000 MW in energy storage projects in development across the world. State legislation and regulations are key drivers in the energy storage market. California, New York, Hawaii, and Texas have all introduced policy initiatives designed to facilitate revenue opportunities and reduced costs of storage integration and interconnection. California’s 2010 Energy Storage Law (AB 2514) mandated statewide energy storage to facilitate market transformation of emerging technologies, requiring state-regulated utilities to procure storage systems or services having 2.25 percent peak load capacity by 2014-2015, and 5 percent by 2020. In October 2013, CPUC finalized a decision that requires the state’s three major investor-owned utilities (IOUs) to collectively procure 1,325 MW of energy storage by 2020. These initiatives have opened opportunities for energy storage companies in the state. For example, in March, Ice Energy signed a five-year deal with Riverside Public Utilities to install 5 MW of energy storage using the company’s Ice Bear product. The Ice Bear technology is installed in large commercial air conditioning units, freezes at night, and then uses the stored ice for cooling throughout the day, rather than relying on energy intensive compressors during peak load periods. Southern California Edison previously awarded Ice Energy contracts for energy storage totaling 25.6 MW in November 2014. Other states with hot climates seem like natural fits for Ice Energy, but the regulations are not in place as is the case in California. For example, wind and solar power generation is increasing substantially in Texas and, much like California, residential and commercial consumers use large amounts of air conditioning, placing significant stress on the grid. In New York, a 2014 partnership between NYSERDA and the NY Battery and Energy Storage Technology (NY-BEST) Consortium is focused on bench-to-prototype technologies that facilitate commercialization of clean-technology energy storage devices. Other initiatives include the 2012 NY Energy Highway Blueprint, which supports energy storage through a proposed $2B initiative to modernize the state’s electric energy infrastructure. NY-BEST and global energy company DNV KEMA Energy & Sustainability partnered in July 2013 to establish a $23M Battery and Energy Storage Testing Commercialization Center to provide testing expertise for viable commercialization of storage products. In Texas, Texas Senate Bill 943, implemented in September 2011, allows interconnection of energy storage projects to the grid and sale of energy or ancillary services to the competitive wholesale market. The Electric Reliability Council of Texas’ (ERCOT) Fast Response Regulation Service, a pilot project launched in January 2013, was intended to test pay-for-performance methods in response to FERC Order 755. Utilities in Texas have responded to the Bill 943 and the state is currently home to the largest U.S. energy storage facility, which is the 36 MW Notrees Windpower Project (completed in January 2013). In Hawaii, Hawaiian Electric, Maui Electric, and Hawaii Electric Light Company proposed in 2014 electric energy plans in response to the Hawaii Public Utilities Commission’s order to develop comprehensive action plans to reduce energy costs, address renewable energy integration challenges, improve customer-sited photovoltaic interconnection, and support demand response programs. By 2030, the action plans would almost triple the amount of distributed solar generation, and achieve more than 65 percent of renewable energy. Recent wind installations in Maui and Oahu have been paired with energy storage, and Hawaiian Electric Company has opened a solicitation for up to 200 MW of storage to add more renewable generation to the O‘ahu grid. While the focus of distributed energy resources has primarily occurred through state-level policy initiatives, federal legislation and regulations could also help re-define the market structures that impact energy storage. On May 6, Sen. Angus King (I-Maine) introduced the Free Market Energy Act of 2015 in an attempt to address the potential for grid-connected distributed generation and encourage innovation in cutting-edge energy technologies. In particular, the bill would establish parameters to govern distributed energy resources, while retaining state authority to design rules within those parameters to properly reflect each state’s needs. States would have to consider rates for distributed energy resources in an unbundled manner, enhancing consumers’ rights to connect distributed resources to the grid, and ensuring proper compensation for grid owners and operators. This, according to Sen. King, would make distributed generation more valuable for individual homeowners and the electric grid. The bill does not currently have any co-sponsors, and its chance of passage will largely rest on whether it can be bundled into the comprehensive energy legislation being pushed by Sen. Lisa Murkowski (R-AK), Chair of the Senate Energy and Natural Resources Committee. However, several of the bills currently included in the comprehensive package would also impact energy storage, including S. 1219 – the “Interconnecting Distributed Resources and Examining Net Metering Act,” S. 1227, the “Micro-Grid Implementation Strategy,” and S. 1220, the “Energy Distribution Act.” On the federal regulatory side, FERC has issued a number of orders that directly impact the storage industry. In October 2011, the FERC issued Order 755 (Frequency Regulation Compensation in the Orga.nized Wholesale Power Market) which requires regional transmission organizations (RTOs) and independent system operators (ISOs) to adopt a two-part market-based compensation method for frequency regulation services – a capacity payment reflecting opportunity costs and a market-based performance payment – rewarding faster-ramping resources, including batteries. In July 2013, FERC issued Order 784, which expands on Order 755, requiring public utility transmission providers to consider two additional parameters – speed and accuracy – when purchasing frequency regulation resources and accounting and reporting requirements for transactions associated with using energy storage devices. As energy storage systems are inherently fast-responding resources that excel in speed, accuracy, and ramping ability, FERC regulations increase opportunities for energy storage projects in the ancillary services market. In November 2013, FERC announced Order 792, adding energy storage to the category of resources eligible for grid interconnection under the Small Generator Interconnection Procedures (SGIP), as well as allowing energy storage projects to participate in the accelerated interconnection process known as Fast Track. The order reduces the time, cost, and regulatory burden associated with interconnection of energy storage projects. In addition to FERC, the DOE’s 2010 Smart Grid Investment Grant Program is structured as a public–private partnership to accelerate investments in grid modernization. It has provided $7.8B for smart grid projects matching $3.4B in federal Recovery Act funds with private sector resources. The 2011 Storage Act provides for an energy investment credit for energy storage property connected to the grid. The Department of Energy’s (DOE) Quadrennial Energy Review (QER) released in April recognizes energy storage as a key functionality to provide grid flexibility, and it signals a continued focus from the Obama Administration on creating a strategy for flexible storage solutions. While energy storage deployment increased dramatically over the past years, installed battery storage capacity only stood at 304 MW in the U.S. in 2013, reflecting the huge growth opportunity (see Figure 3). The report calls on the DOE to establish a common framework for exploring means, methods, and technologies that can enhance grid flexibility, regionally, in states, and load-serving entities. The QER also notes that energy storage is likely to become more important as a means of integrating higher amounts of intermittent renewables into the electric grid. From 2008-2013, the wind-generated electricity has more than tripled while solar electricity generation has increased by more than tenfold. Declining costs and state-level Renewable Portfolio Standards (RPS) are the key drivers for increased renewable generation. For example, the National Renewable Energy Laboratory has found that the average cost for a utility-scale photovoltaic project in the U.S. dropped from approximately $0.21 per kilowatt-hour in 2010 to $0.11 per kilowatt-hour at the end of 2013. The QER recommendations to support grid modernization include improvements to grid communication through standards and interoperability. In addition to DOE’s comprehensive grid modernization proposal (estimated to cost $3.5B over ten years) in the FY 2016 Budget request, the QER calls for a program (estimated to cost $300M – $350M over 5 years) for cooperation within the planning process of state energy offices, public utility commissions, and environmental regulators; with other state counterparts; and with infrastructure owners, operators, and entities responsible for the bulk power system reliability. The DOE’s 2014 Energy Storage Safety Strategic Plan addresses institutional barriers to enhance the safety and reliability of storage addressing grid-scale, utility, community, and residential storage technologies. It identifies current and desired future states of safety and the development, explains deployment of codes, standards, and regulations for energy storage systems, and provides a compendium of CSR and case studies. The Strategic Plan describes the goals, scope, near-term actions, and long-term agenda for DOE’s programmatic efforts focused on four key elements: energy storage system safety technology; risk assessment and management; incident response; and codes, standards, and regulations.